Prisoners in at least 17 states are coordinating sit-ins, hunger strikes, work stoppages and commissary boycotts from August 21 through September 9 — the 47th anniversary of the Attica prison uprising. Prisoners first called for the strike in April, after a bloody altercation broke out at the Lee Correctional Institution in South Carolina, leaving seven prisoners dead and 17 others seriously injured. Demands include: Immediate improvements to the conditions of prisons and prison policies that recognize the humanity of imprisoned men and women; and an immediate end to prison slavery. All persons imprisoned in any place of detention under United States jurisdiction must be paid the prevailing wage in their state or territory for their labor. At New Folsom Prison in the California Central Valley, a hunger strike started by Heriberto Garcia on August 21 has grown. 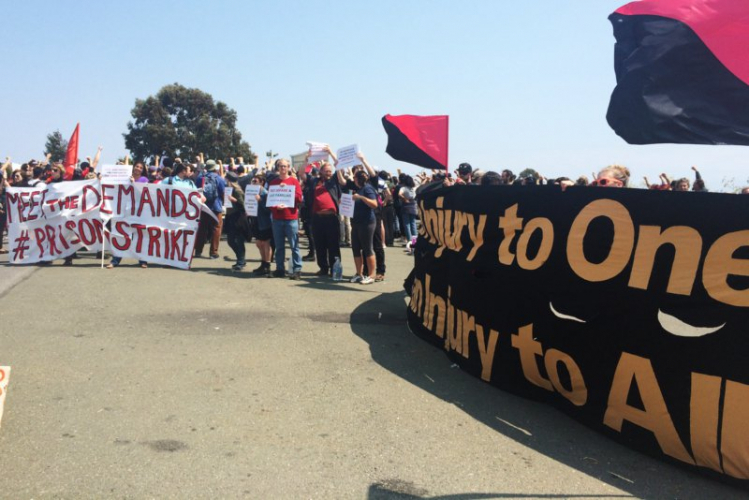 On August 25, around 500 activists turned out for a solidarity rally at San Quentin Prison in Marin County.